“It takes a ridiculously large chunk of our immune repertoire to keep this virus in check,” according to a report published in Scientific American on January 29, 2015. (1) The CBCD recommends two effective, natural remedies against the latent Cytomegalovirus. Most people know that many different environmental variables can damage the immune system. Some of these damaging variables include ageing, radiation, drugs, stress etc. When the immune system is damaged, the number of latent viruses in the body increases, and some even reactivate. New research shows that the human cytomegalovirus (CMV) may also significantly damage the immune system on its own without the assistance of an environmental variable. Dr. Mark Davis and colleagues wrote that “although prior twin studies had hinted that non-heritable factors contribute to some autoimmune disorders, such as multiple sclerosis, the recent analysis was one of the first to quantify genetic and environmental effects on the general immune system … one finding was particularly striking. A single environmental factor - a past infection with common cytomegalovirus - affected 58 percent of the tested parameters.” (1) Dr. Davis is from the Stanford University School of Medicine. The effect discussed by Dr. Davis is further expounded upon by Dr. Janko Nikolich-Zugich, who agreed in another study, saying that “Our research group recently showed that infection with only CMV, and no other acute or persistent viruses, causes defects in immune responsiveness…” (See Arizona State University Health Sciences Center, from October 16, 2014) (2) In other words, if an individual is infected with the CMV, the virus harms the immune system’s ability to fight other pathogens (a biological agent that causes disease or illness to its host). Dr. Nikolich-Zugich also suggested that “improved control of CMV and/or reduction of CMV-specific EM accumulation could be beneficial for immune defense.” (2) In other words, by reducing the numbers of latent CMV in the body, an individual may increase the efficiency and overall health of the immune system itself. The CBCD believes that clearly, a strong immune system will help an individual to fight the many pathogens he or she comes into contact with on a daily basis. What treatments are currently available for those infected with the CMV virus? “Several drugs are approved for the treatment of HCMV infections in immunocompromised individuals. These drugs include ganciclovir, its oral prodrug valgan-ciclovir, cidofovir, foscavir and fomivirsen. 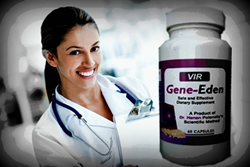 However, the use of these drugs in immunocompetent individuals is limited by their toxicity, poor oral bioavailability, modest efficacy, and the development of drug resistance.” (2) There are also the natural supplements Novirin and Gene-Eden-VIR, which have a formula that was designed to help the immune system target the human cytomegalovirus when it is in a latent form. In light of the information presented above, the CBCD recommends that individuals concerned about CMV infection, and the health of their immune system, take Novirin or Gene-Eden-VIR. Click to learn more about Novirin and CMV and Gene-Eden-VIR and CMV. All orders of these products are completely confidential, and no information is shared or sold to any third party. Privacy is assured. (1) Landhuis, E. "Your Immune System Is Made, Not Born." Scientific American - Published January 29, 2015. (2) The University of Arizona - Arizona Health Sciences Center - "Impact of Lifelong Cytomegalovirus Infection on Aging and the Immune System Focus of UA Research." Published October 16, 2014. (3) CDC.gov - "Cytomegalovirus (CMV) and Congenital CMV Infection." - Last Reviewed July 28, 2010.